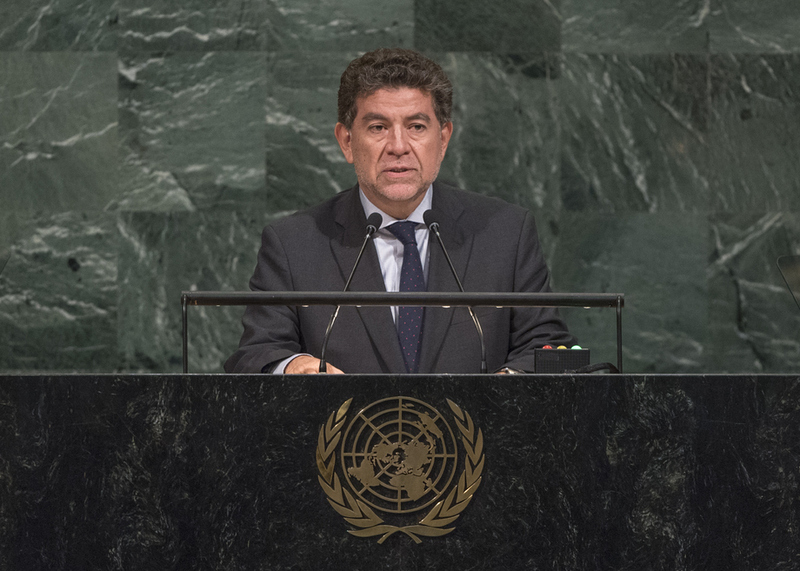 GUSTAVO MEZA-CUADRA (Peru) called for more inclusive globalization based on multilateralism and dialogue. Peru was working to achieve the Sustainable Development Goals and implementing policies to eradicate poverty, with a focus on access to water and hygiene among its priorities. Strengthening institutions and eliminating impunity had been identified as key tools for mitigating corruption. Protecting democracy and human rights in Latin America was a necessity, he said, expressing profound concern over the worsening crisis in Venezuela. Negotiation was the only path to stability in that country and any attempts to intervene would violate the United Nations Charter. In addition, he said Peru was preparing to take its non-permanent seat on the Security Council for the term 2018‑2019. The Council would provide the platform for Peru to more actively promote nuclear non-proliferation, he said, condemning the Democratic People’s Republic of Korea’s nuclear ambitions. The Government would work to foster debate that would lead to the peaceful resolution of tensions on the Korean Peninsula, he assured. Stressing that borderless threats such as terrorism and climate change posed clear challenges to development, he advocated adherence to international mechanisms designed to mitigate those threats in broader efforts to foster stability.